The popular Computer University@Sea program is offered on all cruises. CU@Sea provides e-mail services, Internet access, group and individual instruction on use of a PC, extensive enrichment course offerings and digital camera support. Each ship has at least 25 state-of-the-art workstations. Complimentary classes are offered each cruise. Details of these are listed in the onboard daily newsletter Reflections. There is a nominal setup fee when you begin to use any CU@Sea services involving off-ship communication. Fees apply for e-mail sent and received on board, as well as Internet access. There are media readers for most standard camera memory cards. A unique e-mail address for each guest is printed on your cruise ticket. The private e-mail system supports sending and receiving e-mail messages under 1MB. Messages are sent and received instantaneously, subject to the stability of satellite communications. There is a charge for the first 100KB of each inbound and outbound e-mail, and an additional charge for all additional outbound e-mail ("cc") addresses, and for messages greater than 100KB. The current schedule of charges is available on board. Golf pros are present on most cruise departures. You will find renowned Golf Pros Roberto Borgatti, and others. Crystal Cruises now proudly and exclusively features TaylorMade, the best performance golf company in the world. On board products include TaylorMade's #1 ranked drivers used by PGA pros to lead in distance, accuracy and total driving company. Complete sets of TaylorMade clubs are also available for rental to use in ports where you may wish to play. Golf enthusiasts have the rare opportunity to tee off on as many as six world-renowned courses on a single voyage. Hosted by a visiting PGA instructor, our dedicated Golf Theme Cruise explores some of the best courses in Europe, New England & Canada, and Canary Islands. 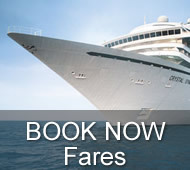 For more details regarding special Golf Cruises, please click here. If your home or business e-mail provider has web access to your e-mail you will be able to access it from the ship via the Internet. If you're not sure, contact your e-mail provider. The current schedule of charges is available on board. 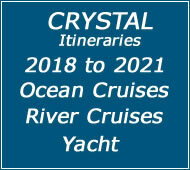 Crystal Cruises is pleased to provide both Wi-Fi service and satellite Internet access for our guests. All on board Internet traffic travels from the ship to a satellite before returning back to earth to load web pages. While at sea, there is no local high speed Internet provider such as you would have at home. Satellite communication is the only way to "plug-in" and access the Internet. We are pleased to offer all the Internet comforts of home, and hope you understand that it takes a little extra time as web pages travel the extra miles for you. 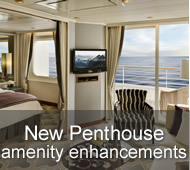 Free Internet/Wi-Fi service for Crystal Society Members: Beginning Fall 2014, on Crystal Serenity voyage 4323 (September 19, 2014) and Crystal Symphony voyage 4224 (October 15, 2014), Crystal Society members (full-fare Crystal guests traveling on their 2nd cruise and future or subsequent cruises thereafter) will receive free Internet/Wi-Fi service for the duration of their cruise! Free internet/wi-fi service amenity (up to 60 minutes, per guest, per day i.e. 10-day voyage = 600 minutes per guest or 1,200 minutes per double occupancy stateroom) is exclusively available to Crystal Society members only. Additional minutes, over the total per guest, per day allotment, are available for purchase as noted above. 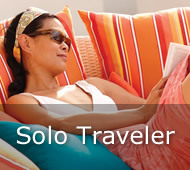 Free Internet/Wi-Fi service is combinable with Suite Amenity Program. †Note: Please be advised that the detailed description of our Wi-Fi Program as published in the original printing of our 2014/2015/2016 Cruise Fare & Itinerary Guide is a part of our Exclusive Crystal Society Savings (on page 52) and was inadvertently placed on the following page (53). Therefore this program does not appear to be a part of the exclusive society savings which it, in fact is. We have amended the online version of our Fare & Itinerary Guide to be correct and will also correct and re-clarify the program details upon our next publish date of November, 2014. Rental PC laptops are available for your use on board for a nominal daily charge. From these computers you can access the Internet as well as your shipboard e-mail from your stateroom. The current schedule of charges is available on board. Some private lesson times are available. You can arrange for these after you arrive on the ship. Fees apply. 3. We can configure your PC or Macintosh laptop for Internet access from your stateroom. There is a charge for configuring your laptop, and current Internet access charges apply; the current schedule of charges is available on board. Pricing is based on time spent online. You have the choice from two plans. If you purchase one of these plans, you will be able to log on at anytime and your available minutes will be decremented only for the time they use the machine. Any remaining minutes will remain available for you until your last debarkation date. Once that date has passed all the minutes automatically expire. A one-time set-up fee of $5.00 is automatically applied to your stateroom account when you first use the private CU@Sea email address printed on your Cruise Ticket. This includes a tutorial in logging on, establishing a password, and instruction in sending and receiving email through the guest e-mail system. Every message sent or received is $2.75 each for the first 100 kilobytes of data (roughly equivalent to 15 pages of text). Messages exceeding this size are charged at an additional $2.00 per 100kb to a limit of 1 megabyte (1,000kb). If you send one message to more than one recipient, or “cc” additional recipients, each is treated as an individual message, and charged accordingly. If you wish to use your own laptop in the privacy of your stateroom, we will need to do a special configuration to make the satellite and server available to your laptop. There is a one-time charge of $15.00 for this configuration. Internet usage from your stateroom costs the same as in the lab. 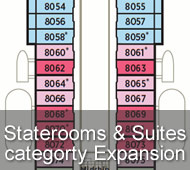 Pre-configured laptops are available for rent at $5.00 per day for use in your stateroom. The same e-mail and Internet pricing applies for these laptops. There is no charge for printing e-mails from your private CU@Sea e-mail account. There is a $19.95 charge for copying (in one session) as many digital images (or other files) as will fit on a single compact disc. All classes are complimentary. Class schedules are available in the CU@Sea lab and are listed daily in Reflections. Lessons are billed at $75 per hour. Please consult the CU@Sea staff to schedule a private lesson. CU@Sea is open 24 hours a day. Please stop by between 7:00am and 11:00pm when members of the CU@Sea staff are on hand to assist you with any of the above, or to explain any of the many services, free classes or pricing structure.